So it's been 2 weeks since I was last weighed and in the last fortnight I have lost 4lbs, whilst not as good as my 1st weigh in this is what I hoped for and in total I have lost 15lbs in 4 weeks! I have almost hit my target of 20lbs in 10 weeks and I still have 5 and a half weeks left. I've also measured my waist and chest and I've lost 3 inches from my chest and 2 and half inches from my waist. 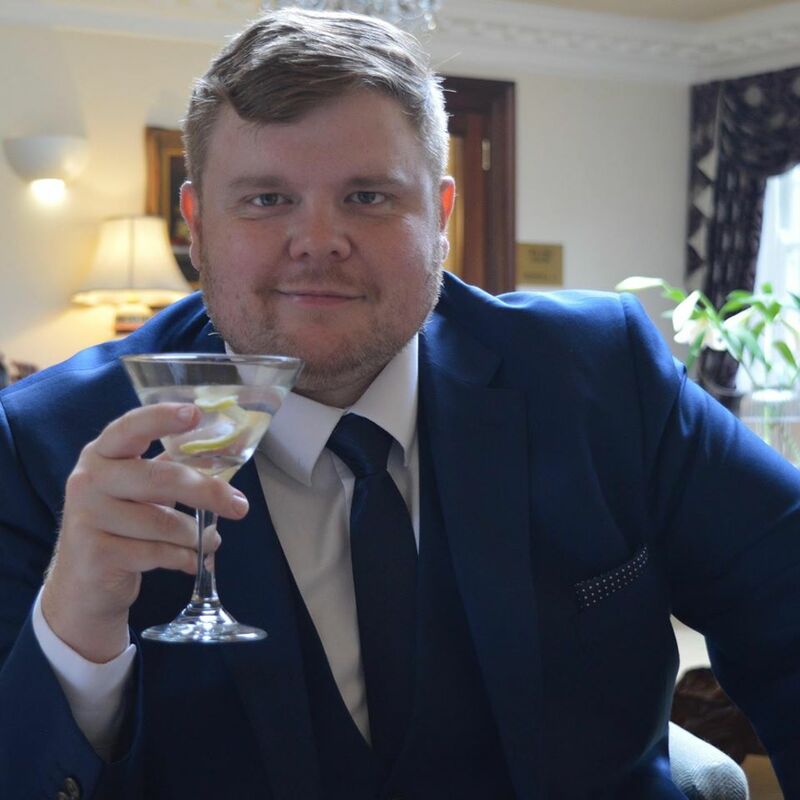 I'm really pleased that I'm still focused on this new lifestyle and I've been encouraged by the fact that I've noticed some of my trousers aren't quite as tight as they used to be and a few people have said they have noticed a difference in my weight. Things like this are really keeping me motivated as well as keeping track of how many calories I've been having and what exercise I've been doing on MyFitnessPal (you can follow me here). Here are a few meals I've had these past 2 weeks. 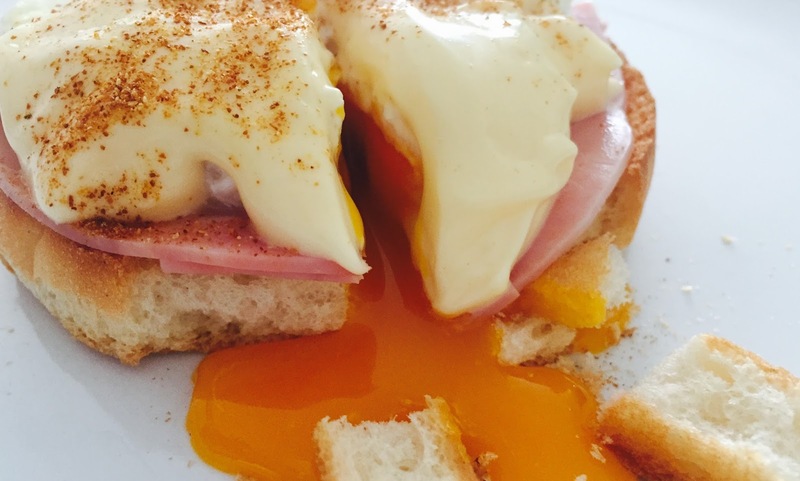 Eggs Benedict, I love eggs and Eggs Benedict is my favourite egg dish but I always think of it as an indulgent breakfast. However I recently found these crispbakes from Sainsbury's as an alternative to an English Breakfast Muffin and they really bring the down the calorie count without sacrificing on taste this version only had 225 calories. Fenwicks Food Hall in Newcastle has some truly amazing food for sale. 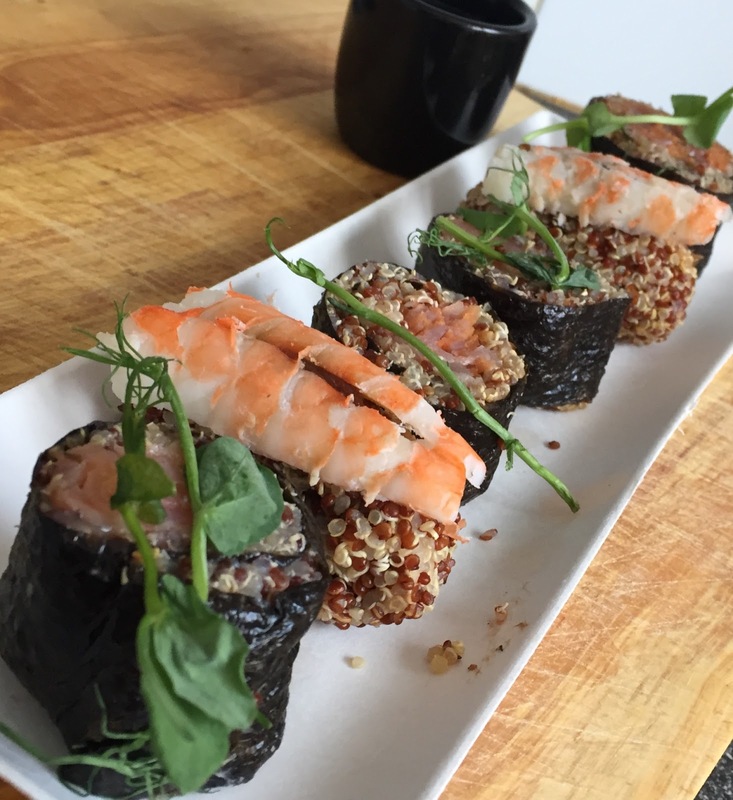 One of the counters is from The Naked Deli (you can find out more about them here) and when I spotted this Quinoa Sushi I knew I had to try it. It was delicious and filling and at only 272 calories it was a great lunch. For some reason over the last 2 weeks I've really had a thing for Avocado. I'm a fully fledged member of #teamavocado. Although I've always liked avocado I very rarely had it but this dish is amazing and got me hooked on it and I now have it as often as I can. This was simply mashed avocado with chopped chilli and coriander on another of the Sainsbury's crispbakes with a poached egg on top. It's only 255 calories each so as I was having this for lunch I let myself have 2. I was all on my own for Sunday Dinner so I could have what I liked and not have to make a little bit of something everyone would like. I got these garlic chicken legs from our local butchers and had it with boiled new potatoes which I then sprinkled with paprika and then roasted them. As well I boiled some sprouts and then finished them in a frying pan with some chorizo. I think 630 calories for a Sunday dinner is pretty good although to get the calories this low you need to discard the chicken skin (which I always say is my favourite bit). Like I said I love eggs and avocado. This is simply a scrambled egg with some chopped chilli on another of the Sainsburys crispbake with a sliced avocado on top, it's only 230 calories! It was when I made this that a few people mentioned to me about having a lot of avocado. This is a grilled butterfly chicken thigh in a spice rub with couscous and half an avocado seared on the griddle pan and for a evening meal it comes in at a ridiculously low 400 calories. Me and Mrs Cool had a whole day and night without the kids so for lunch we went to The Cook House in Ouseburn (you can find out about The Cook House here). This was Pork Rillettes with a courgette and rocket salad (which also had some mixed seeds in there too) and some soda bread. I don't know exactly how many calories this had but after some research online I've estimated it to be around 540 calories. In the evening we met some of our friends for a meal at Osaka which is Japanese restaurant in Newcastle (see here). This is their Teryaki Salmon Bento Box which comes with sticky rice, a cucumber slaw type salad and and assortment of salmon sashimi and salmon sushi. Again I don't know how many calories this had and to be honest I don't care as it was friggin lush. After a day off the avocado I was craving it again and after having a few beers (and my 1st Bloody Mary) I needed a light lunch. 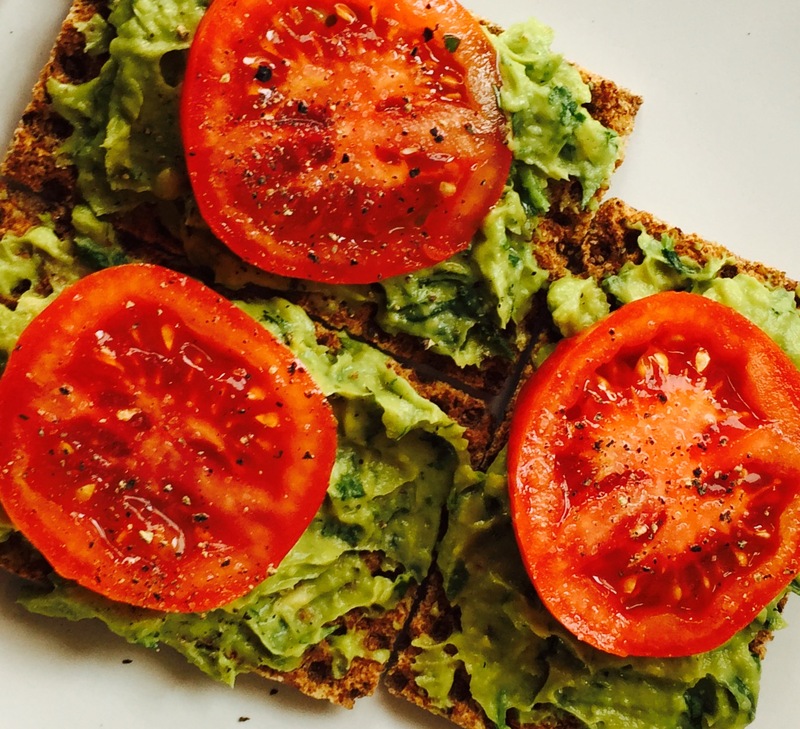 This is a few slices or Ryvita with mashed avocado and chopped coriander with a slice of tomato on top. This is only 104 per slice. Every other weekend I work Saturday, Sunday and Monday so don't get a chance to spend time preparing good meals but this weekend we have some cod loin which was in a latino dry rub and then baked in the oven. This was served with spinach, rocket and avocado (again) and I made my own mustard vinegarette. It was a delicious summery dish and only 580 calories which I thought was good for an evening meal. I'm usually the one who cooks in our house but every now and then Mrs Cool will have my dinner waiting for me coming home from work. 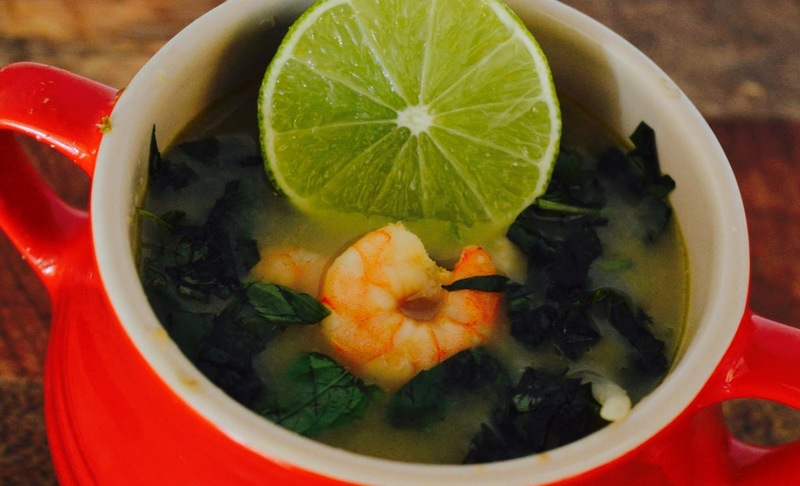 One of her best meals is this Thai Prawn Broth (you can find the recipe here). It's very filling and only a mind bogglingly low 330 calories. I'll be doing another update in a couple of weeks so keep an eye out for it. You're doing great. And the meals look fab too. Keep it up. Ok on a scale of 1 to 10 how much do you love avocado? I'm going to say about 11!! I love the look of the cod. I'm not a massive meat eater so I'm trying to get more fish in my diet. Looks lush. Thanks for the comments. Honestly I'm obsessed with avocado at the minute. I had a little bit left over last night so put it in my salad too.